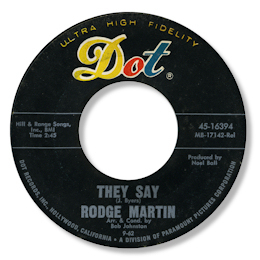 As with all the singers that he was financially involved with, Bill “Hoss” Allen made sure that Rodge Martin got plenty of exposure on his wonderful TV show “The Beat!!!”. Martin, who was born in Georgia around 1940, appeared in no less than four shows and sang eight songs – and looking at his performances more than 40 years later it was clear he was a big man with talent to match. He had the true southern soul singers raspy tone and a lovely sense of timing, very apparent on his rendition of “That’s How Strong My Love Is” in particular. 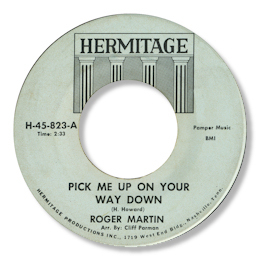 Martin’s recording career had already begun by the time he made contact with Allen, making a disc for Noel Ball who was Dot’s Nashville supremo. “I’m Standing By” is a pretty good “Stand By Me” styled tune, and the lively “They Say” has had dance plays. Although Martin sings strongly with some good gritty phrases, the arrangements are a bit to “pop” for my taste. Much better were the sessions in Memphis that Allen financed. The first of these featured the funky little “Lovin’ Machine” with it’s great “cheesy” organ figures and red hot horns, in front of which Martin grates out the boastful lyric with confidence and a lovely throaty tone. When She Touches Me is a lovely country soul piece that Martin gives a very fine performance on – note the great drumming from Howard Grimes and guitar from Teeny Hodges. Two Women is in a similar vein, and the way Martin gets to grips with the song may be even more impressive. First class for sure. 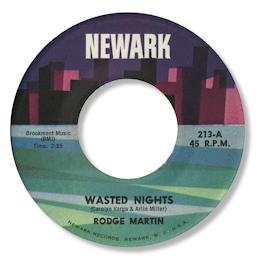 As indeed was the excellent Wasted Nights which made a trio of deep soul tracks that realty ought to be better appreciated than they have been to date. I don’t think Rodge’s Nashville sessions for Allen quite reached these standards. The uptempo “I’ll Be Standing By” is good but not outstanding, and “Pick Me Up” is a very pleasant country number but neither has quite the “bite” that the Mephis cats brought to their tracks. Just when Martin was really getting into his stride he was cut down by a heart attack in 1967. So sad – and what a lost talent. He is buried back home in Georgia. Note ~ You can find "Wasted Nights", "I'll Be Standing By" and "Two Women" on the excellent SPV CD "The Rogana Story". 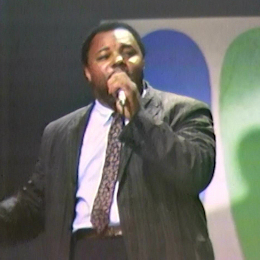 A duet with Jimmy Church "Soul Shack" can also be found on the Blue CD "The Rich Records Story". "Close My Eyes", "When She Touches Me" and "Lovin' Machine" can be found on the ROAD CD "Nashville's Got The Beat". "When She Touches Me" and "Close My Eyes" are also on the Superbird CD "Rare Blues & Soul From Nashville The 60s". Special thanks to my friend Fred James whose untiring efforts on behalf of Nashville R & B deserves much wider recognition.